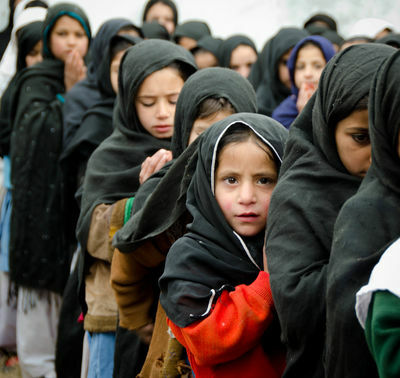 A girl prays during a morning school assembly at her primary school in the village Sijban, Swat Valley, Afghanistan. 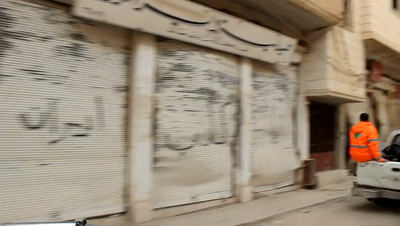 A montage of sample clips from Deir Ezzor, Syria. 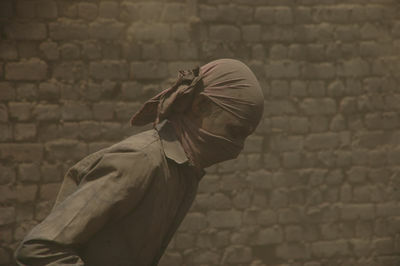 "A rusty affair"- A worker covers his face with a piece of cloth while working at a metal polishing factory during International Labour Day in Lahore, Pakistan. Many laborers throughout the country often work under difficult and dangerous circumstances without using proper safety equipment. 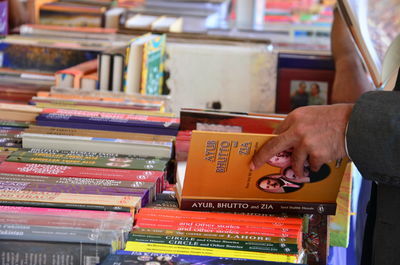 Visitors look at e books during Islamabad Literature Festival. 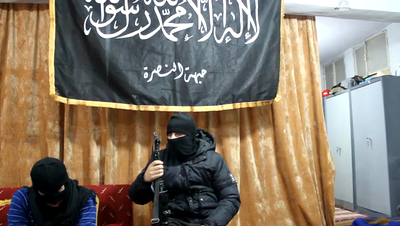 Interview with Abu Hasim, a Jabhat al-Nusra field commander (dressed in black), and Abu Ishaq, his spokesperson (blue sweater), conducted at their headquarters in Deir Ezzor. They explain why they welcome foreign fighters in Syria and how they want to establish Islamic rule over Syria. Among other things, they address suicide bombings, their position towards religious minorities and their relations with al-Qaida in Iraq. In the phase following Bashar's removal, our first and primary objective is to establish an Islamic nation ruled by the Qur'an. With some groups that are fighting the regime, we believe that there are shared interests in terms of overthrowing Bashar. But after Bashar is gone, we have our own aims and plans. Terrorism is a doctrine for Muslims. We do not receive financial support from other countries-- not from Al Qaeda, the Arab League or NATO. Until now, Christians have not turned against us. We'll deal with the issue of Christians, Armenians and other minorities after we get rid of Bashar. Abu Ishaq: I will speak in terms in accordance with Sharia law, so the term revolutionaries is not acceptable, we are waging Jihad. I see myself as one of the mujahideen, fighters who have gone out to fight in the name of God and establish God's law in this land, and this is a legitimate right that is in our hands. Bush spoke of the war in Iraq as a crusade, citing the Bible. So as Muslims we have the right to follow this religion and to fight against anyone who stands between us and this objective. AI: The truth of the matter is that the infidels are the ones who enter our lands so we are not the ones who attack them. At the moment, we see the FSA as a legitimate group that defends the faith and we support them to be victorious. This is how it looks to us. In the future, we may act differently, but at the current time we support the FSA against Bashar and his allies to overthrow them. We show them the meaning of self-sacrifice and Jihad, which is not limited to carrying arms, as the Prophet said: “Fight the inidels with your money, souls and tongues.” So Jihad in our Islamic Sharia has all these forms, fighting with weapons, with the pen, helping the poor, protecting public institutions, all these are forms of Jihad.In the phase following Bashar's removal, our first and primary objective is to establish an Islamic nation ruled by the Qur'an. In terms of the civil state, if this is to be a civil state as to the fact that it's governed by institutions, this is not against the law. But if it is to be a democratic state then of course we say no. But if it is a country of institutions according to God's prescription, then yes. AI: This is our aim, an Islamic civil state. Like Abu Satef says, if it is a country against Islamic prescriptions then we don not agree to it, but if we say we create this, this and that institutions then we are OK with it – there are two meanings to the word civil. AI: This is one of the faulty ideas, that politics and Sharia are far apart. There is a book called “The Book of Sharia Politics”, written by some scholars, and some concepts can confuse people. Politics is a part of religion, and it is not to be separated from religion – otherwise we would become secularists. With some groups that are fighting the regime we believe that there are shared interests in terms of overthrowing Bashar. But after Bashar is gone, we have our own aims and plans. We know that we are in the right. AI: Since the time of the Prophet until God takes over his land and who is on it there will be falsehoods. When Muhammad came out with his call, they said he was a poet, a wizard, a liar. This is the way of unjust people, tarnishing the people who are in the right. And terrorism is a doctrine for Muslims. AI: No, these are lies, the Front is a group among many that fight for Syria to topple the dictator and install the law of God. We do not receive financial support from other countries-- not from Al Qaeda, the Arab League or NATO. AI: First, all our strenght comes from and is the will of God. It is the faith of our fighters, the suicide attacks of our heroes that make us what we are in relation to other groups. But our weapons we have obtained from Bashar's soldiers. AI: The mass media spread false allegations in order to destroy the truth. How can we compare suicide attacks with bombings by American fighter jets that destroy entire cities? They are just a drop in the ocean. One or two civilians get killed but if we compare this to thousands who get killed by German or US soldiers in Afghanistan then you have to agree this comparison is unjust. Deir Ezzor is suffering from the absence of foreign media. Especially if you think about that this is the region in Syria with the most oil. But thank God we are advancing every single day and we will pursue this goal until every square meter of Deir Ezzor and Syria is freed. AI: alhammdulah we have many members ... but I can not tell exactly how many we have. We have no financial support from al-Qaeda or Arab countries or any foreign country. All our weapons were snatched by our heroes from regime soldiers in battles. AI: What characterizes the Front in combat situations is the courage and the discipline of our fighters. Thank God many fighters arrived who helped in past revolutions in Libya and Iraq. This is what makes us stronger in combat. We have many specialists and missile experts. Also our social work has been well accepted by the Syrian people. We are known for our our services and that we protect their property. AI: There is no proof that our brothers were responsible for this operation. According to my knowledge, the regime planed them in order to destroy the positive image of the fighters. They have not presented us with proof. If al-Nusra were responsible for this attack it would have been one of the very few mistakes. In every military organization orders by the commander have to be followed, this is also true for those by Abu Muhammad al-Golani. This is true for combat units but also for the Emirs who lead entire cities. 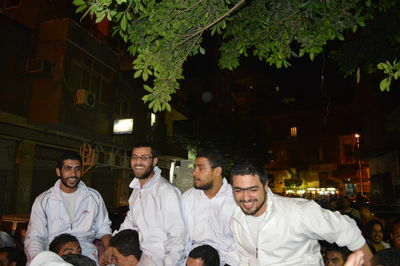 In the end they all respond to the orders of Sheikh al-Golani. There are many false rumours about us. Jabhat al-Nusra is in a situation of self-defense. We defend the people of Syria. It is Bashar who murders children and rapes women. We are not responsible for that. It is America, Walid bin Talal and the Jews who control the media. ... [missing translation] AH: Our aim is to demonstrate our faith to the almighty God and to end the injustice against muslims. This includes Christians and all other faiths that accept the divine sharia. AI: Until now, Christians have not turned against us. We'll deal with the question of Christians, Armenians and other minorities after we get rid of Bashar. 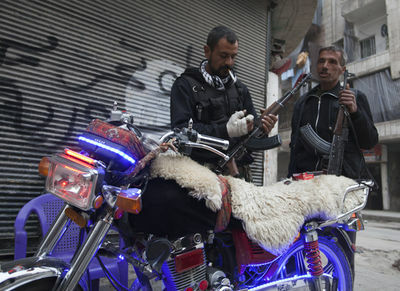 Two Free Syrian Army Soldiers stand guard with their neon bike in the district of Bustan Basher in Aleppo. Driving towards the airport frontlines. All planes and helicopters used to bomb the city are based here. For more than a month the Free Syrian Army has been trying to storm the airbase. Civilian buildings alongside the road have been abandoned and mostly destroyed. Following Free Syrian Army rebels to the frontline. They hide their positions in fields and farm land. Landscape surrounding the airport of Deir Ezzor. A conquered regime position in the background. Free Syrian Army trench and sniper positions. One commander shows an empty AK-47 magazine. His troops are suffering heavily from ammunition shortage. Rebels moving towards the airport walls. They shoot an improvised mortar round at enemy positions. 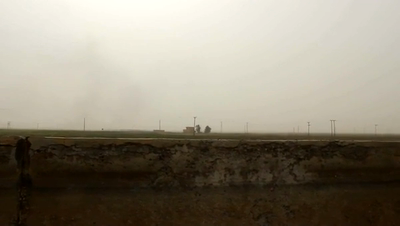 In the background an oil well is burning. Most mortar rounds are build in improvised factories in Deir Ezzor. Rebels assemble a Russian anti-tank rocket, fire it at government positions, then run for cover. 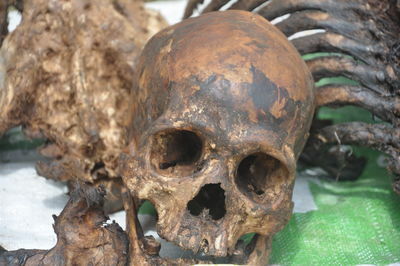 Since the 1994 Genocide, Rwandan refugees from that conflict- and from subsequent events- have created a population of over 150,000 (some say 250,00) living around the world. In June of 2013, most of these refugees will lose their refugee status and be forced back to Rwanda by the UNHCR (United Nations High Commission for Refugees) and host countries. The refugees fear repatriation to a country they see as oppressive, dictatorial and discriminatory. 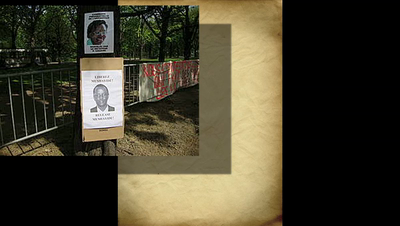 This film explores why it is NOT a proper time to invoke this return by the UN and host countries. It has interviews with major figures in refugee studies, Paul Rusesabagina (The REAL "Hotel Rwanda" person), Theogene Rudesingwa (former Ambassador to the US from Rwanda) who has been exiled as well as UN officials, Human Rights activists and refugees themselves. Much of the film was actually shot by the refugees. Kisenyi is the oldest slum/ghetto in Kampala. The Mask and the Teacher will guide you through an incredible journey along this multi-ethnic reality. 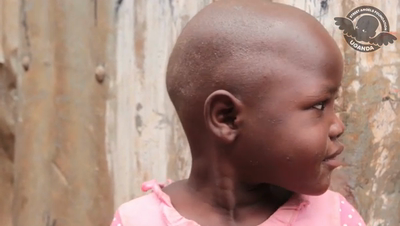 We meet the Karamojong women, listen to real story of the kids of the slum and dance to unique music. Witness the incredible reality in the heart of Kampala.